There aren’t a lot of McLaren Formula One cars in private hands. There are even fewer Monaco Grand Prix-winning, ex-Aryton Senna McLaren Formula One cars in private hands. And that’s exactly what we have here. This car, chassis MP4/8-6, was purchased by the current owner directly from McLaren in 2006. This was McLaren’s first season with Ford-Cosworth power after years with Honda. This car uses a 3.5-liter naturally-aspirated Ford-Cosworth V-8. Power was about 680 horsepower, one of the lowest numbers on the grid. This chassis contains the exact same engine and transmission that was in the car when it won in Monaco. It’s pretty amazing as a car and even more amazing that someone gets to actually own this and it isn’t a display piece in a museum. 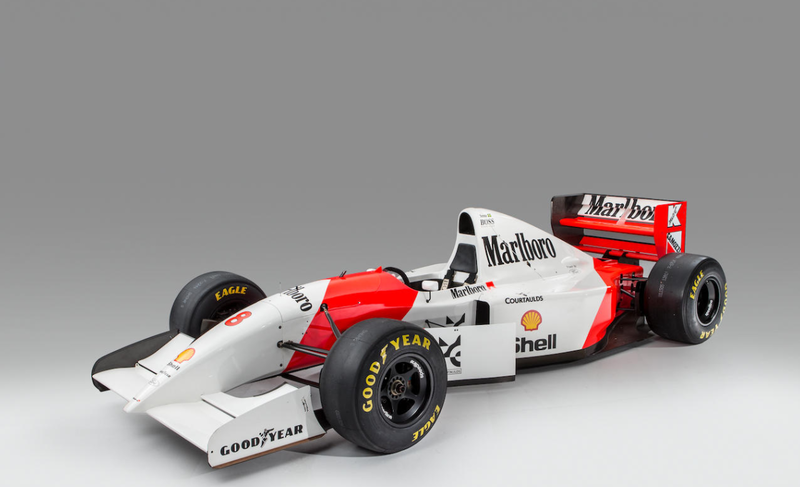 Think about it: you can own and drive a Monaco-winning McLaren that Ayrton Senna used. Sure, there are other Senna-driven cars out there, but would you rather have a Toleman or a McLaren? Exactly. This is the only car in Bonhams’ sale that doesn’t have a pre-sale estimate, which should give you a hint as to the expected price. You should check out more about this car here and you can see more from Bonhams in Monaco here. This entry was posted in Uncategorized and tagged auctions, Bonhams, cars, classic cars, cosworth, f1, ford, formula one, mclaren, mp4/8a, race cars by classiccarweekly. Bookmark the permalink.